OK, this is the third and final instalment of this series of diaries about our reaction cards. In the first one I talked about our old reaction system and, then, in the second one, Skaff talked about his and Richard’s proposal to create a new system based on automatic responsive play. So I think we’ve talked enough about the process by which we got to this system and now I just want to introduce it properly. Blocks are great because they will complete nullify an enemy card. 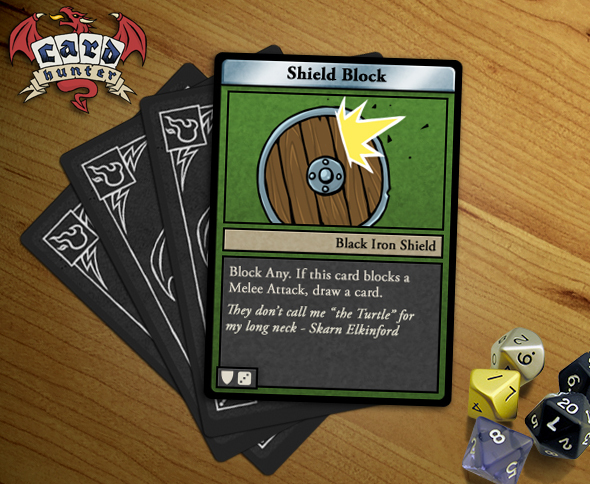 In this case, it doesn’t matter what the card is – it could be a melee attack or a spell – it just doesn’t matter, because the shield block will take care of it, assuming you roll high enough. To remind you, what happens is that when your opponent plays a card targeting you, you roll a die (or rather, the computer rolls for you) and, if you roll a 3 or higher, the Shield Block “triggers” and stops their card dead. Blocks generally only work once. That means your opponents can draw them out with their weak attacks and then let fly once they’ve left your hand. You can only block attacks from someone who isn’t behind you, so watch out for back-stabs. Hmm, so what if you want long-term all-around protection instead? Well, then you want some Armor! Armor doesn’t stop an attack – it just reduces the damage. The amount of damage it reduces is listed after the Armor keyword on the card. So, Armor 3 reduces the damage by three. Armor returns to your hand after it gets used! You can tell that from the little card icon in the lower right of the card. That means that an Armor card presents a long-term problem for your opponent. 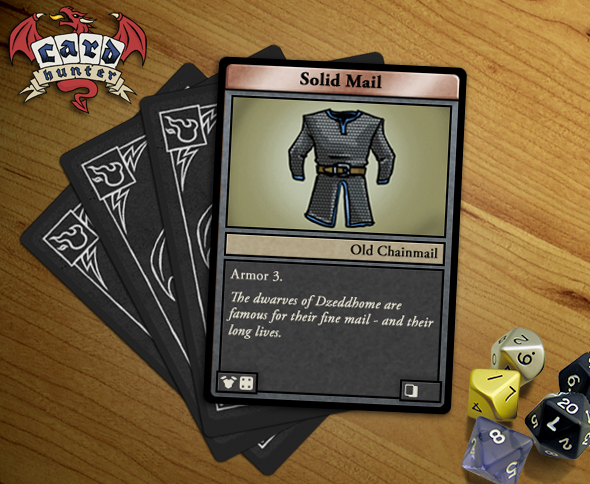 If you have Solid Mail, for example, and your opponent has a hand full of Attacks that do 3 damage, there’s only a 50% chance that any one of them is going to do anything. As another bonus, Armor also works from all around, so you don’t need to worry about getting stabbed in the back quite as much. Why would you ever use a Block card then? Well, Blocks have their advantages too. Although Armor is pretty durable, it’s not as much use if your opponent has a really damaging Attack. If I get hit for 10 damage and only have 7 health, the fact that my Armor reduced the damage by 3 isn’t going to seem that exciting. Additionally, Blocks stop cards dead – they don’t just reduce damage. If an annoying Wizard tries to Teleport me, an Armor card isn’t much use because Teleport doesn’t do any damage anyway. But a Block might be just the thing. So Armor is plenty counter-able and so are Blocks. But they are definitely useful parts of a defensively minded character’s arsenal. And these are just the simplest examples of our reaction cards. There are lots of other ways we use this system to create interesting cards and strategies. We’ll be revealing those over the coming weeks in our card previews. Meanwhile, next week we’re going to take a break from game system design and talk about the game from a completely different point of view. Gee, I didn’t realize Shield Block would stop things like Teleport. What fun! You’ve previously indicated that most cards are able to target allies as well as enemies. I might want my own wizard to teleport me out of a lava pit — how do blocks and armors react to “friendly fire”? Well the block card does say “Block Any” which i do find interesting from a magic standpoint, blocking a magic spell might be a little weird thinking about it. Also i dont assume you would be blasting your own allies with your magic spells unless your in the midst of your wizards Area of effect spell in which case im sure you would block it just the same. As for healing spells im sure there is the case that lets ally friendly spells through to help you. All in all, sounds great. Cant wait to make my warrior tank so full of armor he cant move. I’m not 100% sure it’s that simple, so I asked. It seems like a lot of extra rules – checking whether “ally” or “damaging” – for a game that lets you blithely Thrust a dagger in your friend’s gullet. >:D Why should the defense have friendly fire protections but not the offense? Yeah, you don’t block cards targeting you from allies. Your armor will trigger if you get caught in a blast from a fireball that an ally cast though. The reason why we let you stab an ally but don’t have the block trigger is that stabbing an ally is under your control and you may have a reason to do it. Triggering a block is not under your control and 99% of the time you don’t want it to trigger. It would be super-annoying if the game chose to have you use your Shield Block to block a healing spell, for example. @Melodatron – it’s a good point. It’s pretty hard to stack your deck with Armor cards. That said, there may well be classes or items that allow you to take more Armor than you normally would. Thanks for the new update! I really like the system as a whole, armor looks like a lot of fun. Why have the block be an automatic reaction? Why not let the player choose whether to spend the block on that dagger thrust or keep it for that dragon’s fire blast? @zipdrive: you should check out the previous diary entries linked to at the top of this blog post. Basically, we did have a system where you could choose your response and it was too slow. @zipdrive: The main point we were trying to get across was that we had a system where you could choose to block or not and it was fun and had plenty of strategy. The problem was that it just took too long. Many games were going 45-60 minutes, which is a problem when you want deck building to be an integral part of your game too. That’s why we tried to come up with an alternative that retained the feel of attack and defense but got it done much more quickly.